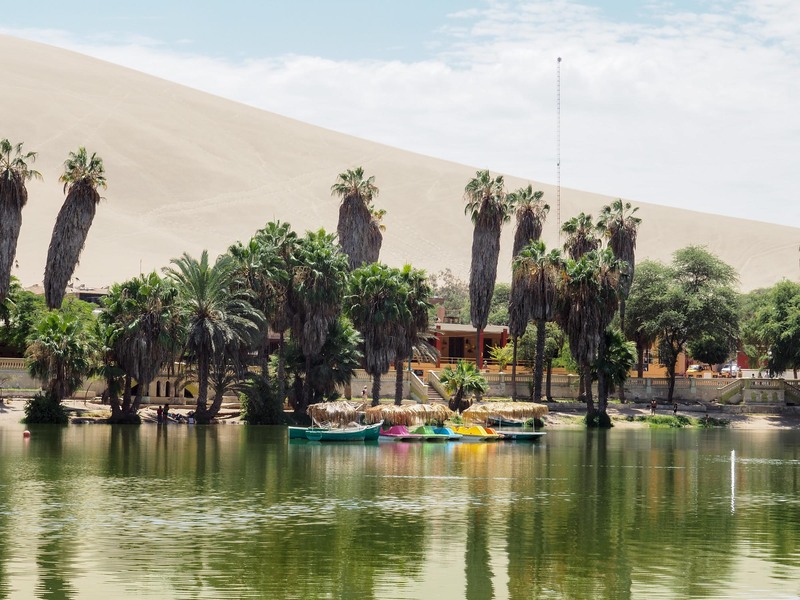 A little desert oasis town, Huacachina doesn’t have a lot more to offer than sand, sunshine, and sandboarding. 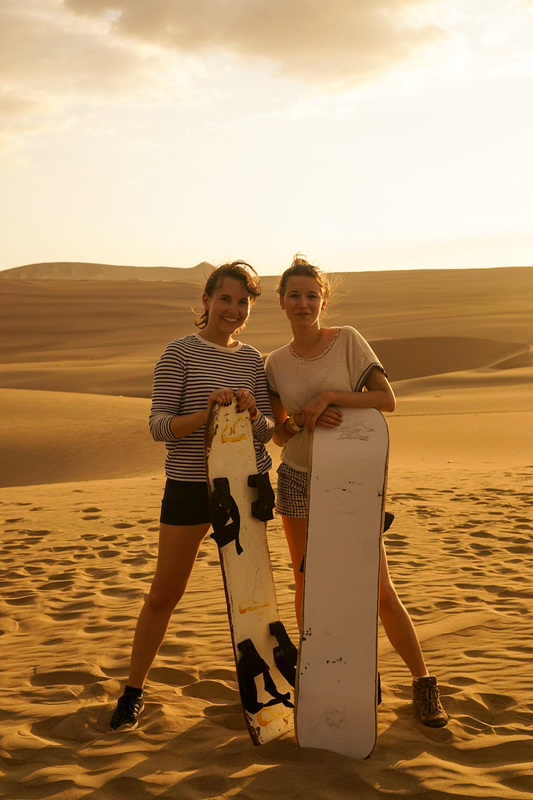 In case you haven’t heard of sandboarding before, it’s just like snowboarding but on sand and a lot more difficult! After seeing a few pictures and videos online, I was very excited about giving it a go. 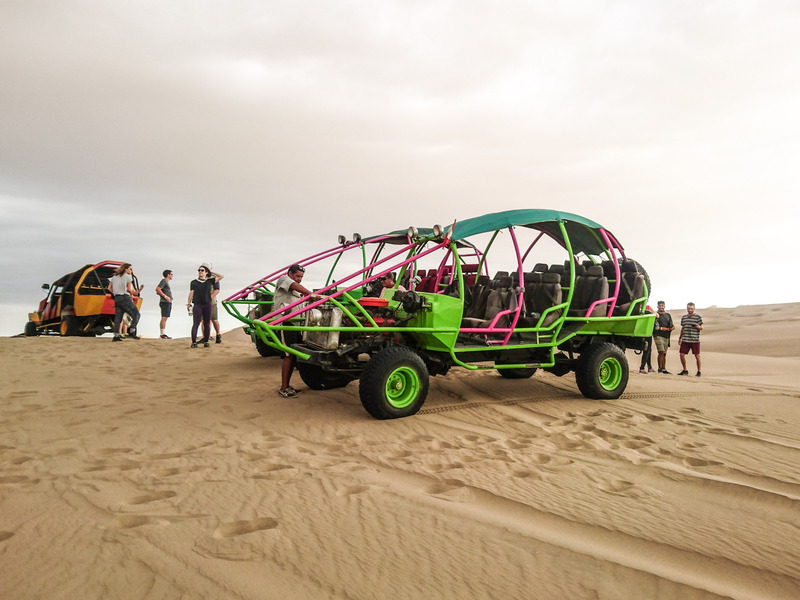 Before you get to swish down the dunes, you have to hop onto one of these dune buggies and let the driver do his thing. 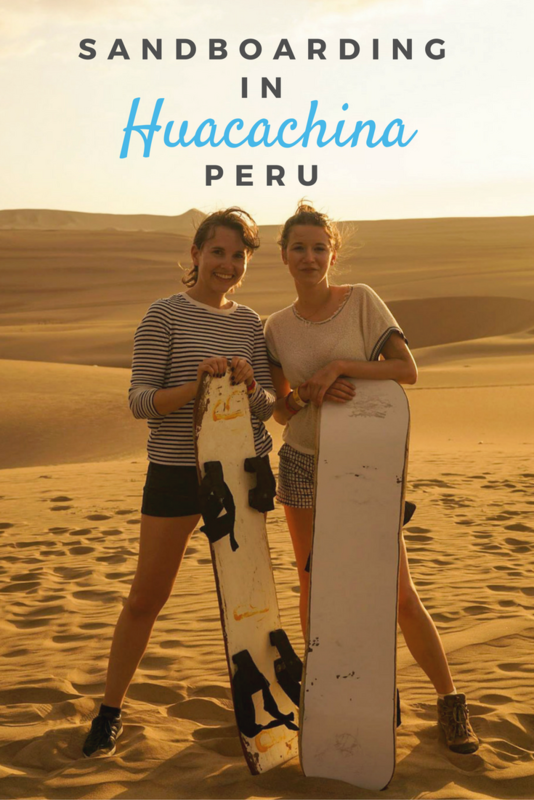 I think this was simultaneously the scariest and the most fun thing we did during our time in Peru. Make sure your seatbelt is tightly fastened because this is one hell of a bumpy ride! 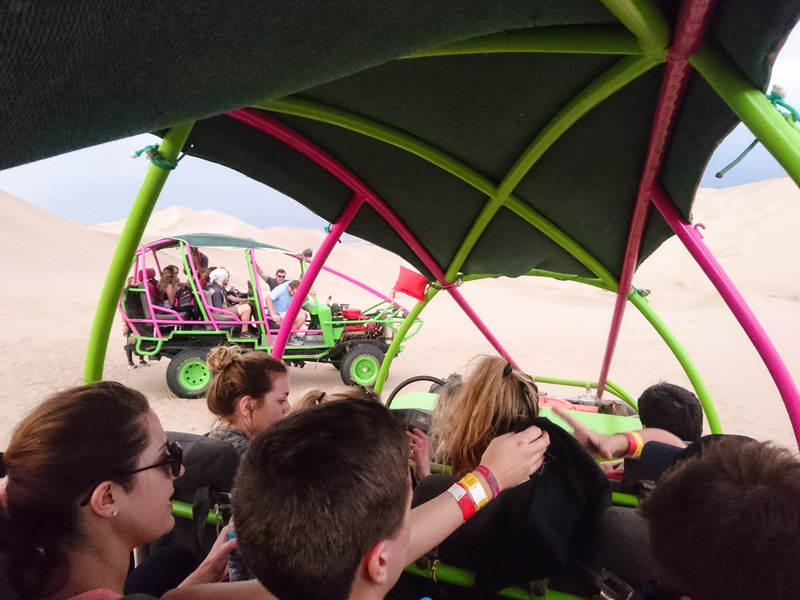 The buggies fly over huge bumps and ride downhill on the steepest of inclines! I held onto my seat the whole time with a huge grin on my face. And I don’t even like rollercoasters! [left] [/left][right]After that scary ride we were told to grab our boards and start waxing them. Most of the boards have seen a lot of action in their time so you need the wax to make sure they slide over the sand properly. 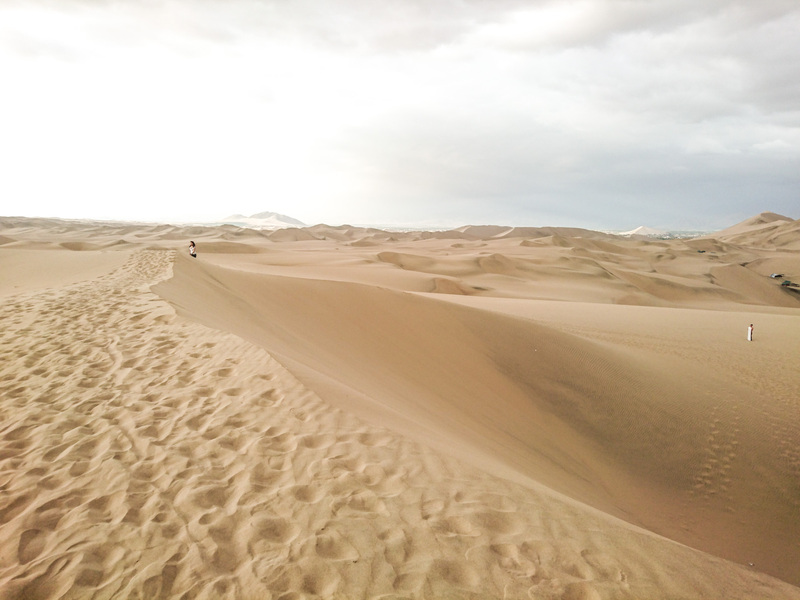 My friend Arina and I were both way too scared to go down a big dune so we practised on a very little one. The buggy drivers are there to help people and one of them helped us practice. First we tried sitting on the boards, then we went down lying face first. It wasn’t nearly as bad as we thought it would be! In the end we both plucked up the courage to go down the big dune, and it was really fun! 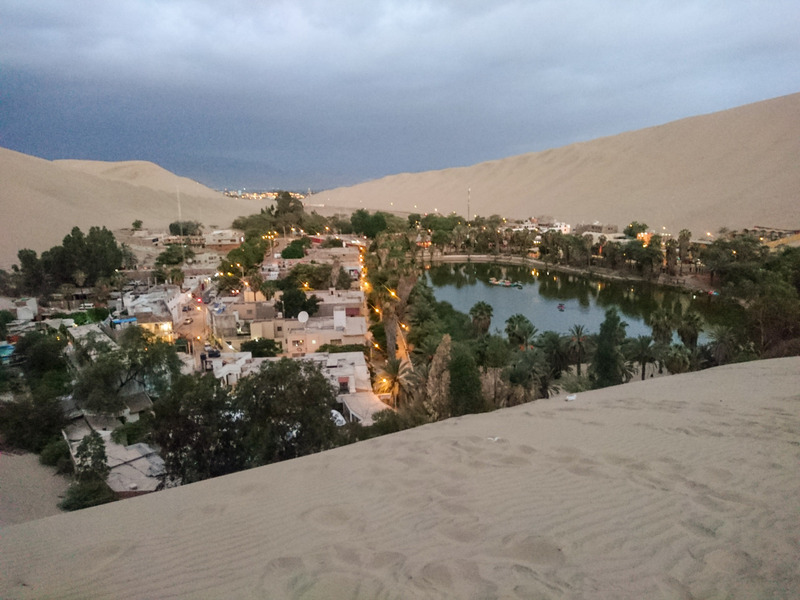 If you go to Huacachina please try it! You don’t have to do it standing up like you’re snowboarding – it can be more like sledding if that’s what you’re comfortable with. 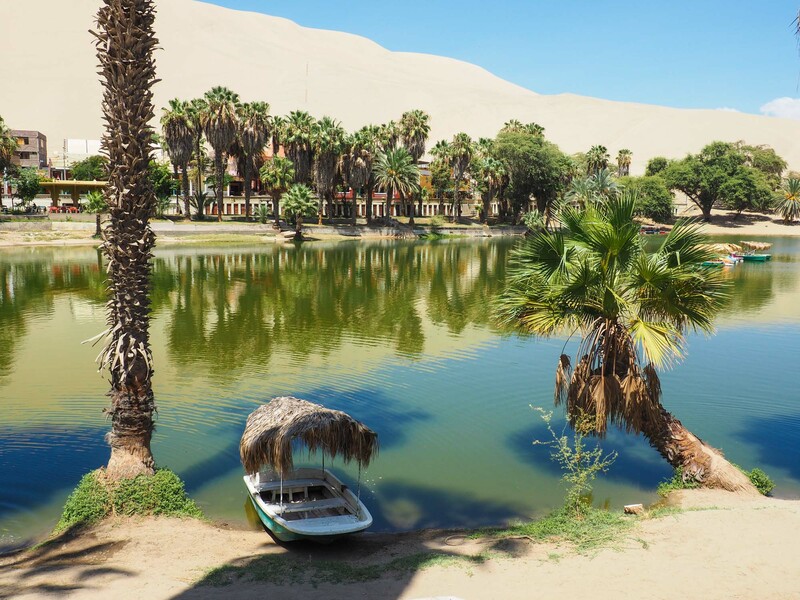 Other than dune buggies and sandboarding, I really don’t think there is much to do in Huacachina. You should make sure your hotel has a pool and a bar! We enjoyed our time at Banana’s Adventure Hostel. 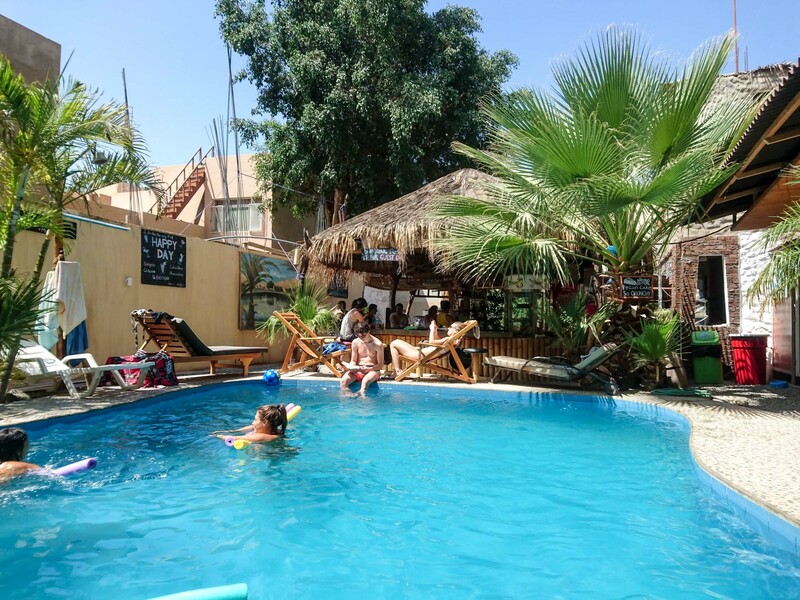 It has a pool, a nice bar, outdoor space to lounge around in, and decent food. Actually our breakfast there was the best of our entire trip! Fresh tropical fruit and pancakes, yum. We met some great people at the hostel. 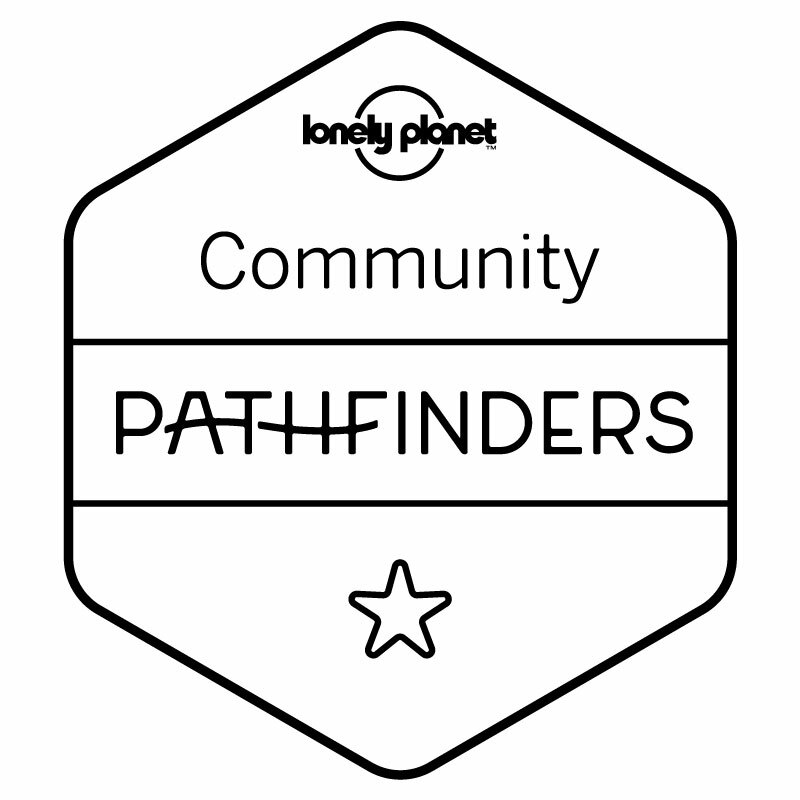 One guy saved my life by lending me his camera charger (I forgot mine in London – a blogger’s worst nightmare!!! 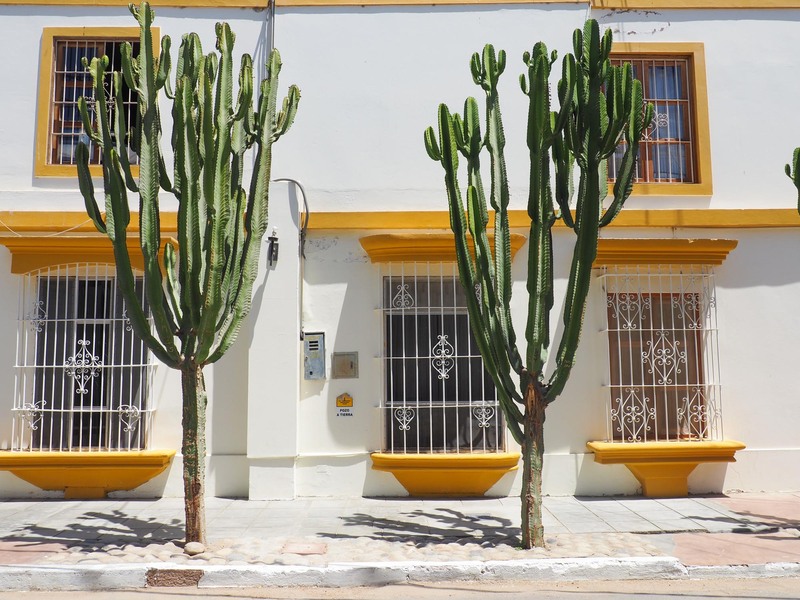 Luckily I had three batteries) and we ran into our roommate twice in the following week and ended up drinking with him in Cusco. 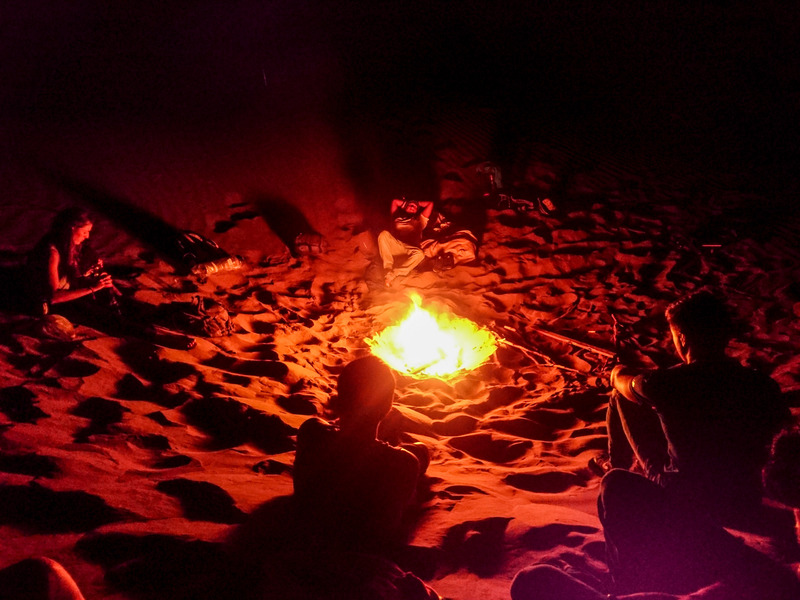 The barman became our friend too, and after his shift he took a group of us to his friend’s bonfire up in the dunes. 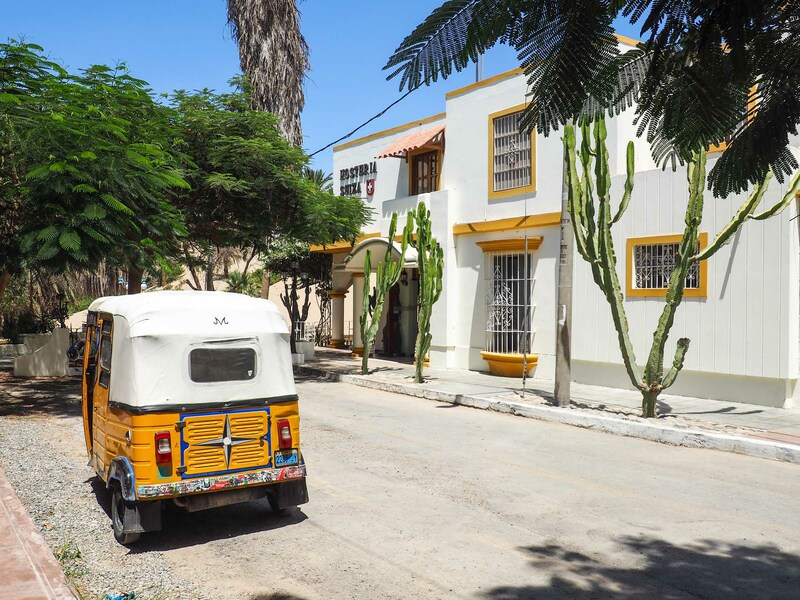 We were all a little tipsy, surrounded by friendly stray dogs, it was very dark and we had a really hard time finding the fire – it was hilarious. We drank beers by the fire until late, speaking a mix of Spanish and English and celebrating the lovely barman’s birthday at midnight. The most memorable experiences are often the ones you don’t plan! 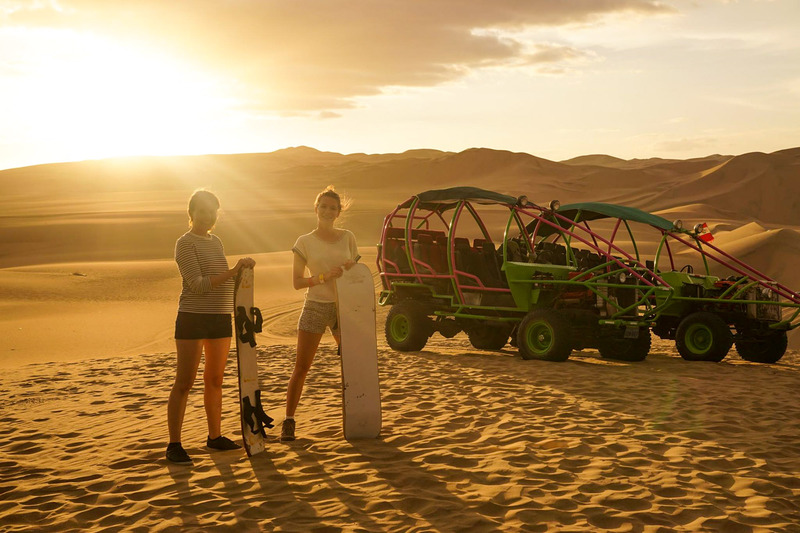 What do you think about sandboarding? Would you try it?